In the early evening of 4 July, 1928, a fabulously wealthy businessman named Alfred Loewenstein boarded his private plane at Croydon Airport. It was a routine flight that would take him across the English and French coastlines before landing at Brussels, where Loewenstein lived with his wife, Madeleine. But he also had many enemies. 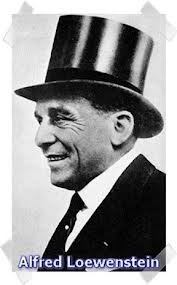 In 1926, he established International Holdings and Investments Ltd. that raised huge amounts of capital from wealthy investors. By 1928, these investors wanted some return on their money. Loewenstein was pleased to be flying home on that July day in 1928. It was a fine evening for flying with scarcely a cloud in the sky. The pilot, Donald Drew, was able to assure him that it would be a smooth flight. It was to prove smooth for everyone except Alfred Loewenstein himself. He was to vanish in mid-flight and mid-air, one of the strangest disappearing acts in history. Suicide? Murder? Or unexplained mystery? Some 85 years after Loewenstein’s disappearance, the jury is still undecided. There were a total of six people on that ill-fated flight in addition to Loewenstein himself. The pilot, Donald Drew, stood by the doorway of the plane as the passengers boarded. He was joined in the cockpit by Robert Little, the mechanic. The cockpit was a sealed unit with no connecting door to the rest of the plane. Once the Fokker had taken off, Drew and Little had no access to the cabin. 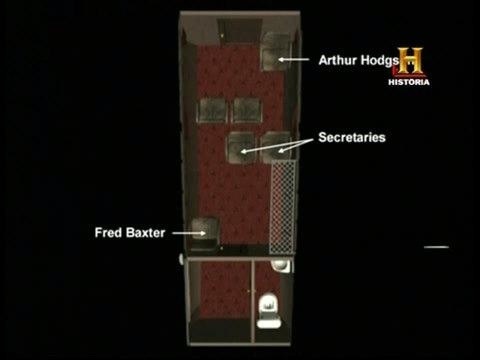 The other people on board included Fred Baxter, Loewenstein’s loyal valet, who accompanied him everywhere, and Arthur Hodgson, his male secretary. There were also two women, Eileen Clarke and Paula Bidalon, his stenographers. Shortly after 6pm, the Fokker FVII, a small monoplane, set off down the grass runway. Within minutes the plane was airborne and climbing to its cruising altitude of 4,000 feet. Before long, everyone on board could see the Kent coastline below. A minute or so later, they were flying over the English Channel. At the rear of the Fokker’s cabin there was a windowless door that led into a small toilet. This room also had an exterior door – the only means of entrance and exit to the plane. The door was clearly marked EXIT and was equipped with a spring-loaded latch controlled from inside. It took two strong men to open in mid-air, due to the slipstream pressing against it. Loewenstein spent the first half of the flight making notes. Then, as the plane headed out over the Channel, he went to the toilet compartment at the rear. According to statements later made by Baxter, his valet, ten minutes passed and he had still not returned to his seat. Baxter grew concerned and knocked on the toilet door. There was no answer. Worried that Loewenstein might have been taken ill, he forced open the door. The toilet was empty. Alfred Lowenstein had disappeared into thin air. An obvious course of action would have been for the plane to divert to St. Inglevert airstrip which lay between Calais and Dunkirk. Here, they could alert the coastguard to Loewenstein’s disappearance. Instead, the pilot landed on what he believed to be a deserted beach near Dunkirk. In actual fact, the beach was being used by a local army unit. When they saw the plane landing, they rushed to meet it. It nevertheless took them six crucial minutes to arrive at the stationary plane. By that time, both passengers and crew were standing on the sand. They were questioned by Lieutenant Marquailles. Pilot Donald Drew behaved strangely, evading his questions for half an hour until admitting that they’d lost Alfred Loewenstein somewhere over the English Channel. Next to question the pilot was a professional detective, Inspector Bonnot. He was puzzled by what he was told. He arrested no one and even allowed the plane to continue its flight to St Inglevert and thence back to Croydon. The ensuing investigation was bungled from the outset. Loewenstein’s body was finally retrieved near Boulogne on 19 July, more than two weeks after his disappearance. It was taken to Calais by fishing boat where his identity was confirmed by means of his wristwatch. An autopsy revealed he had a partial fracture of his skull and several broken bones. Forensic scientists concluded that he had been alive when he hit the water. The mystery of how he fell to his death remained unanswered, though there were many theories. Some said the absent-minded Loewenstein had accidentally opened the wrong door and fallen to his death. This was most unlikely, given that it was virtually impossible to open the cabin door in mid-flight. Others said he’d committed suicide, perhaps because his corrupt business practices were about to be exposed. 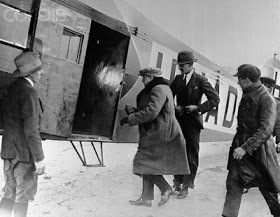 A far more plausible (and sinister) explanation is that Loewenstein was forcibly thrown out of the plane by the valet and the male secretary, possibly at the behest of Loewestein’s wife, Madeleine. She had a very frosty relationship with her husband and was desperate to get her hands on his fortune. One thing is clear: all six people on board were almost certainly privy to the murder. Indeed, they had almost certainly planned it carefully in advance. One theory as to why the Fokker landed on the beach was in order that a new rear door – already stowed on board the plane – could be fitted to replace the one jettisoned over the Channel.